America’s oldest public hospital started as a tiny, one-room infirmary in a New York City almshouse in 1736. Two hundred and eighty-one years later, it’s a sprawling hospital center complex with almost 900 beds, a massive outpatient service, dozens of adult and pediatric specialties, and medical care provided in over 200 languages. 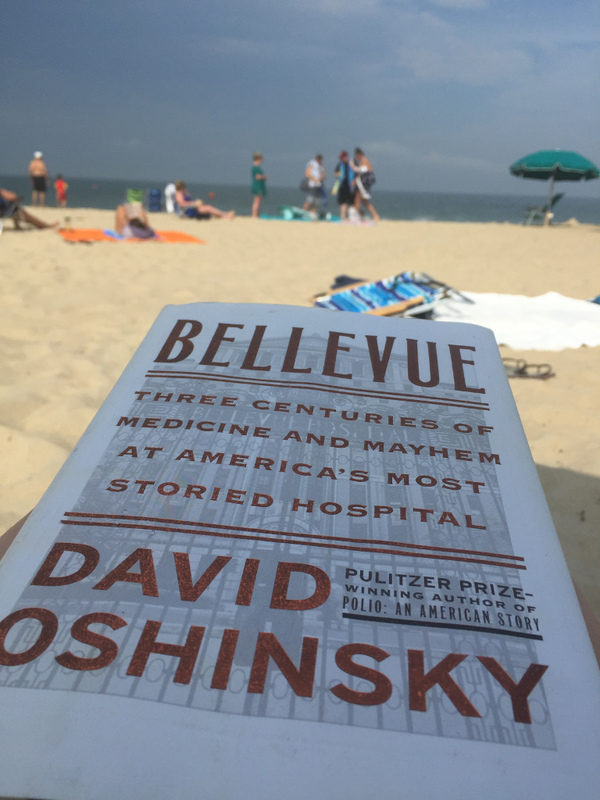 David Oshinsky narrates this transformation in Bellevue: Three Centuries of Medicine and Mayhem at America’s Most Storied Hospital. From yellow fever to HIV/AIDS, from amputations without anesthesia to microsurgery, from germ theory to electroshock therapy, and from charity care to Medicaid, Bellevue has participated in almost all medical breakthroughs of the past few centuries. It also contributed to the development of new tools, such as ambulances, that are now ubiquitous. And, although it’s embedded in the American popular imagination for its treatment of celebrities and psychopaths, it is also, Oshinsky argues, “our quintessential public hospital — the flagship institution of America’s largest city, where free hospital care is provided to the ‘medically indigent’ as a right, not a privilege” (4). Bellevue is, to be sure, an institutional history. But it’s also a history of medicine, of New York City, and of America. It’s therefore a history of the intersections of immigration and medicine, poverty and disease, gender and urban space, religion and public health, technology and forensic science, infrastructure and mental health, and war and medical education, to name just a few of the topics that emerge over 322 pages of fast-moving text. Since its publication in December 2016, plenty of book reviewers have rightfully lauded Bellevue — the New York Times (“distractingly interesting”), the Boston Globe (“deliciously readable”), the Chicago Tribune (“deeply engrossing…a compelling tale”), the New York Review of Books (“excellent”), the Seattle Times (“comprehensive, fascinating, and informative”), and Nature (“sweeping” and “vivid”). As is typical, reviewers have also pointed out some flaws, mostly absences. They want more on Bellevue’s “symbolic cultural legacy,” more about its criminal psychiatric ward and services for survivors of torture, more stories of average doctors and patients, and more relevance to contemporary health care debates. And, as some reviewers noted, Oshinsky can overplay his hand. For example, in an otherwise fascinating chapter, he overemphasizes the importance of Bellevue to the development of forensic medicine. Bellevue was important, but as the work of legal historians such as Mitra Sharafi and Binyamin Blum show, colonial agents of the British Empire became deeply invested in forensic medicine in the mid-nineteenth century, long before Bellevue’s pathology department entered the scene. Briefly, here are three (of the many) ways Bellevue offers lessons in the craft of historical writing. It would be strange to write a book about a hospital that witnessed and evolved through a number of epidemics — yellow fever, cholera, typhus, tuberculosis, HIV, Ebola — without discussing them. At the same time, it can be hard to write about topics for which an extensive literature exists. Take yellow fever: early Americanists know that it decimated Philadelphia in 1793. Eventually, the devastating consequences of yellow fever contributed to the creation of the U.S. Public Health Service. But in 1795, when yellow fever arrived in New York City, physicians, including those who treated the poor at what was then known as Bel-Vue, did not understand the disease mechanism. They knew only that it was deadly and that the poor seemed to die more often. The unresolvable torment caused by yellow fever is old hat to a historian of medicine. So what does Oshinsky do to make it relevant and interesting? He points out that these doctors frequently noticed the prevalence of mosquitoes in their journals and letters (17). By incorporating the ordinary observations of medical practitioners affiliated with the hospital, Oshinsky offers a window into the way they experienced yellow fever and the ways yellow fever shaped Bellevue’s early history, even as New York’s medical men remained clueless about the importance of their notes. Bellevue Hospital Medical College opened its doors on April 11, 1861. The following day, Confederate gunners rained down cannon fire on Fort Sumter, in Charleston harbor, and the Civil War began. In two sentences, he bridges the previous chapter (on Bellevue’s role in professionalizing medical education) to the new one, establishes the broader history in which he’ll discuss Bellevue, and identifies the Civil War as an important agent in Bellevue’s history (its New York location did not isolate it from either the literal or figurative wounds of battle, and it contended with an influx of injured patients despite a staff depleted by conscription and enlistment). The Civil War’s tentacles stretch across multiple chapters, and Oshinsky resists the temptation to lob all the details at the reader at once. Instead, he parcels out background information as needed. Chapter 9, “Nightingales,” for example, underscores that the Bellevue Training School for Nurses (established in 1873) owed a debt to the Women’s Nursing Corps and discusses the role of women and wartime nursing when relevant to later advances at Bellevue. Likewise, chapter 7, “The Bellevue Ambulance,” connects the Civil War and New York City’s simmering Protestant-Catholic tension to illuminate how and why the horse-drawn ambulance contributed to Bellevue’s standing. With chapters ranging from 9-24 pages, Bellevue packs a lot of material into small containers. Put differently, these chapters are one-third to two-thirds the length of many an academic monograph, yet accomplish as much if not more than longer chapters. Chapter 11, “A Tale of Two Presidents,” weaves together the death and life of two presidents, James Garfield and Grover Cleveland with the trajectories of two Bellevue doctors, William Welch and William Halstead. The connective tissue is the effort to convince American physicians and surgeons to accept English surgeon Joseph Lister’s Germ Theory. The resistance to antiseptic medicine played a role in Garfield’s death from an assassin’s bullet, while the acceptance of disinfectants, clean instruments, and a sterile surgical field helped prolong Cleveland’s life. In between, the new research university at Johns Hopkins, philanthropy, Robert Koch’s discovery of TB bacteria through the lens of a microscope, and the discovery of cocaine as a nerve blocker (and addictive drug), effectively show the multiple moving parts that changed medicine. There’s lots more to learn from Bellevue — about structuring sentences and about the history of a major public hospital. Its compact but connected chapters make it easy to pick up and read in short intervals, which makes it an ideal companion for an afternoon at the beach, an evening at the beer garden, or a weekend at the lake. Everyone has their writing tics, but I probably wouldn’t have noticed the almost 30 instances of the word “hardly” had I not just culled numerous instances of the word from my own book manuscript. Return to text.